General. 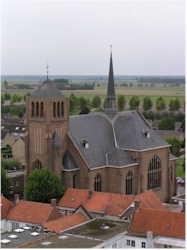 If you think that Sluis is a sleepy little medieval town, then you couldn't be more wrong. It's actually a very lively shopping town, once notorious for its sexshops. A few of those sexshops are still there but let that not be an excuse not to go to Sluis because this charming little town has a lot to offer: cozy terraces, many restaurants known for their tasty mussels and other delicacies, markets, several walking and biking trails and especially a lot of shops. Everyone can surely find something in line with their taste and wallet. History. Sluis was founded as the last port of Bruges and originally had the name of "Lamminsvliet". Due to the silting up of the Zwin (the natural access to the sea), bigger ships were no longer able to reach Bruges or Damme. To solve this, a new port was built closer to the sea, but still on the banks of the Zwin. That port would later become Sluis. 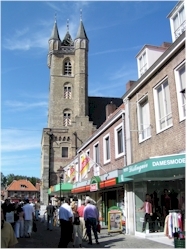 The fate of the town was closely linked to the situation in Bruges and the Zwin. Periods of prosperity happened simultaneously in both towns as did periods of decline. The start of the settlement must be situated in the second half of the 13th century. This settlement developed very fast and soon received town rights (that happened already in 1290). Merely a century later (in 1382), the first fortifications were built. Sluis also used to have a castle, and that was a very big one. Its construction started in 1385. Unfortunately, because of a French artillery attack it was damaged so severely that its remains had to be torn down in 1820. The town walls however, which had last update in 1702, still largely exist together with a few of the town gates. These walls are now part of a very nice walking trail around the historic center. Sluis was an important town and this not only because of the huge revenues it generated as a thriving harbour, but also because of its strategic location. Bruges, once one of the most important towns in Europe, depended for its wealth largely on its access to the sea. That access was via the Zwin and at the end of the Zwin was Sluis. The one who controlled Sluis, could block virtually all transit to Bruges and strangle it economically. 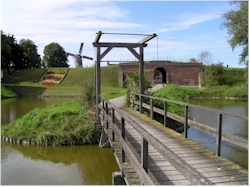 Throughout the years Sluis has been the scene of several battles. In 1340 there was a huge battle at sea in front of the gates of the town in which the French fleet was crushed by the English. Despite the fact that Sluis was more or less a subsidiary of Bruges, armed interventions by Bruges was necessary now and then to restore its rights. It happened that traders in Sluis did not respect the stack rights and tried to sell goods themselves instead of on the markets in Bruges. The 80 years war (1568 - 1648) left a lot of traces in the region; many forts were constructed in that period. The town was occupied by the Duke of Parma in 1587. However, in 1604, Prince Maurits of Nassau recaptured it from the Spaniards. 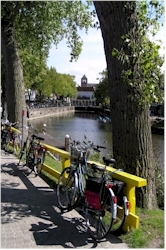 From that moment on Sluis has been a part of the Northern Netherlands. The frontline from that conflict still is the current border here between Belgium and the Netherlands. The last siege of Sluis in late 1944 was the most devastating one. Allied forces assumed that Germans were using the place as a stronghold and conducted an air raid on the town. The bombing was useless from a military point-of-view and transformed the historic center into rubble. Fortunately the town was rebuilt after the war, not as a copy but with a lot of respect for the rich past so that nowadays we can still enjoy its beauty and have an impression of the wealth that made this place prosperous in the Middle Ages.